Long cordless range (150 m indoor 1 km outdoor). IP67 rated (protected from immersion in water and dust proof). Nuisance Call Blocking technology installed. Built-in answer machine and text messaging. Robust handset with belt clip. 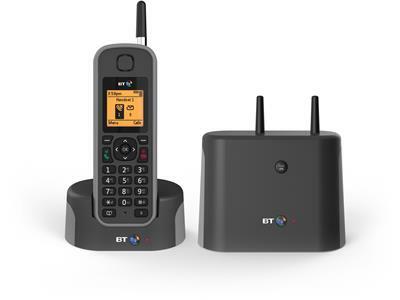 2015 brings BT Elements 1 km long range IP67 rated Cordless Phone with Answer Machine with up to 30 mins recording time and Nuisance Call Blocker. More rugged, more robust and far more aesthetically pleasing than its predecessor this BT Elements is ideal for the workshop, the warehouse, the outdoors or even just at home with the kids. This robust BT Elements is IP67 rated meaning this ruggedised handset is protected from dust and water immersion (depth between 15 cm and 1 m for up to 30 mins). This phone also has a long cordless outdoor range of up to 1 km and up to 50 m indoors. RK Communications supply BT Elements 1Km Longrange Cordless Telephones. Enjoy the freedom of your office, warehouse or any large outdoor environment with the outstanding range of up to 1000 metres. The Newer ruggedised design combined with reassuring weatherproof technology means you can make calls indoor or out, confident in its durability. The phone comes complete with a stand-alone base unit that can be plugged into any telephone socket or power supply, freeing up the charger pod to be plugged in anywhere you want. It also has the ability to be connected to four additional handsets. Fed up with unwanted calls interrupting you at home or at work? This phone’s Nuisance Call Blocker puts you back in control by enabling you to choose the calls you want to take and those you want to block. With up to 13 hrs talktime, up to 160 hrs standby time, handy belt clip and handsfree feature, this phone will let you move around freely when life gets busy. The integrated answer machine also makes sure you never miss an important message should you miss or not be able to take a call. This phone also supports SMS text messaging and features a clock, calendar and alarm. Other useful features include a 200 name and number directory, a handy 6 line mono display which is backlit and has contrast control, 50 number calls list, 30 number redial list and call waiting indicator. This phone also has 10 polyphonic and 5 standard ringtones to choose from, a VIP indicator, 9 quick dial memories, a keypad lock and secrecy function.